Below you will find our Frequently asked questions if you can not find the answer to our frequently asked questions you can always send us an email with your specific question(s). Just click on one of the questions and the answer will be revealed instantly. How many grafts will I need in my hair transplant? In order to determine the number of grafts needed for your hair transplant procedure, a number of factors are important. Because the donor area must contain a large number of grafts. So instead of asking how many grafts, you need the first question is actually “how many grafts are available in your donor area?”. Most people have a pretty good area with adequate donor grafts.so in answer to the most frequently asked questions we can say show us your current hair situation. How large is the area that needs to be treated? Frequently asked questions number two is how we determine the number of grafts needed. We always will work in order to get a natural cover. Because most of the time the surface area becomes larger, there will be more grafts necessary for a good result. Due to blonde, black or curly hairs different results will be established. Because curly hairs cover very well, it leaves you with relatively fewer grafts in order to achieve a very good result. While blonde hairs are generally thinner and cover less than other hair colors, most of all this means we have to implant an as high as possible a number of grafts in order to create a good density. First of all, the density of the donor area determines the number of grafts that can be removed. As a result, high density probably allows for lots of available grafts. This is advantageous when a large area needs to be treated. So the more available donor hair the better the result. 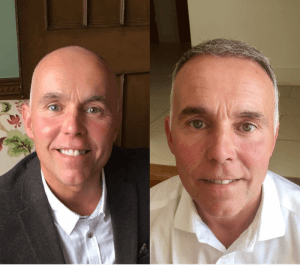 How long is a hair transplant visible? After the grafts (hair roots groups) are implanted, the skin will see some red. In addition, there are small cabs visible at the places where the hairs are placed. From the second day after the treatment, you should start washing the hair. You will receive special shampoo for the first weeks after the hair transplant. When you start to wash you will see that every day more scabs disappear until finally there is no crust to be seen. There can only remain some redness. This redness will fade more and more until there’s nothing left to see. If a hair transplant is visible after the procedure strongly dependents on the area that has been treated. When the grafts are implanted between existing hairs they will stand out less than when they are in a bold area. During a consultation, we can estimate how the outcome will be for you. The number one frequently asked questions; When will I see the end result? After 9 to 12 months the end result is visible. 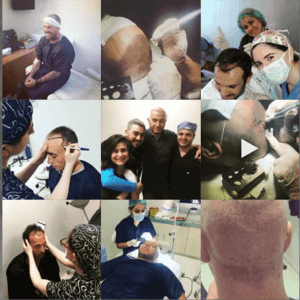 After 12 months, you will be invited by us to take some photos, based on the pictures on the day of the hair transplant to evaluate the final result. Hairs will fall out, this is a natural process, which carries out the hair root after it is transplanted. This is normal and therefore you don’t need to worry. The new hair will start to grow after a break of about 4 months. In the early growth, the grafts will proceed unevenly. This process will stabilize itself in the course of time. In the beginning, it can be very fine and thin hair or the hairs curls or squirm while your hair normally is straight. In the course of time, the transplanted hair will be thicker and stronger and gets back its natural characteristic. All terms are trying to indicate how many “groups” of hair are replaced. A graft may consist of one to four hairs or hair follicles. An older name for a one hair graft is single-graft. For multi hair follicular units the term ‘micro-grafts’ is sometimes used. Other names for follicular units (laser) pulses or grafts. By (laser) pulses almost always one hair grafts are involved, the ‘hole’ is made by a laser. Please note when comparing providers that you compare these terms unambiguously so you get a good picture. The FUE treatment has an average duration of six to eight hours. Of course, this is among other things, depending on the nature of the transplant and the number of grafts to be transplanted. Therefore it isn’t easy to make a precise prediction. Is a hair transplant reimbursed by a health insurance? There are no health insurers known to us who reimburse the cost of a hair transplant. If there is a hereditary hair loss e.g. androgenetic alopecia they will not cover it. If there is a medical indication for example, by an illness or accident, it is advisable to discuss this with your health insurer. Frequently asked questions cannot give a clear answer on this issue. 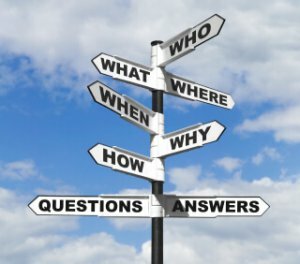 Can I have a consultation in the UK? Yes, you can. Because we have an exclusive agreement with LabsClinic in Northampton. 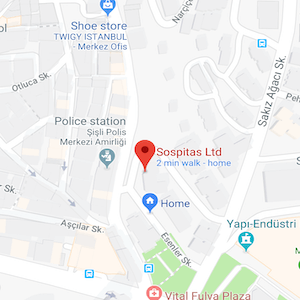 So, therefore you can make an appointment with them and they can help you with all the details for your hair transplantation procedure in Istanbul, Turkey. In conclusion, you can contact them by filling our contact form and mention you want an appointment. How long is the waiting time for treatment? The waiting time for a hair transplant treatment is on average six to eight weeks in the UK. Turkey can be treated within a week after the confirmation of your flight! The price depends on the number of grafts to be transplanted. Through an overview on our website, you can estimate what the cost to you about. The exact cost of hair transplant can be determined after sending some photos in the contact form. How long after treatment can I exercise/sport again? We recommend not performing sports for 2 to 3 weeks or other strenuous exercises. After 3 weeks you can again do easy workouts (jogging, cycling, tennis), provided that you do not engage in contact sports (football, rugby or other similar sports). After 1 month, you can get back to practice all sports. How long after treatment can I work again? Perform heavy physical labour, as well as work in dusty areas, should be avoided for about two weeks. A week of rest / free is recommended at all times. What distinguishes Sospitas from other providers? First of all Sospitas works with experienced specialists. Our surgeons concerned only with hair transplants and each carries out at least 400 hair transplants per year. As a result, the accompanying medical team specializes in microsurgery. While other clinics and hospitals even don’t know that specialization to that extent.Sospitas knows different techniques, all offer solutions for very specific situations. Each individual course requires a different approach. So Sospitas has the knowledge in-house. In addition, Sospitas works to the highest standards and we are the first hair transplant clinic with severe ZKN mark. Because of this, we guarantee a high quality of medical care in an efficient and personal medical treatment. Yes, the transplanted hairline will look just like a natural hairline. The many years of experience of our surgeons with more than 5,000 treatments behind their names have ensured that this is possible. Check out our photo gallery to see it yourself. A FUE hair transplant will be carried out with needles between 0.5 mm and 0.7 mm, therefore there will not be visible scars. So, as a result not even with a shaved haircut, there will be visible scars visible. The number of hair restoration treatments required may vary individually. This is among other things depending on the intended purpose and the degree of baldness. For smaller bald areas one treatment is often enough. For larger bald areas, a second treatment is a good option. However, the first treatment will be implemented so that it can stay with one treatment and you can decide later whether to schedule a second treatment. We guarantee that all (97%) of the transplanted hair continue to grow for the rest of your life. This is among other things depending on the intended purpose and the degree of baldness. So smaller balding areas one treatment is often enough. For larger bald areas a second treatment is a good option. Consequently, the first treatment will be implemented so that it can stay with one treatment and you can decide later whether to schedule a second treatment. 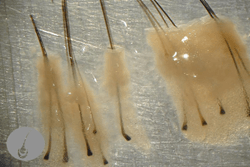 How much hair can be transplanted? The frequently asked questions should be how many hairs we can remove in one go? An average man from Western Europe has 60-80 grafts per cm2 available on his head. Therefore in a Norwood scale 4 is the treatment surface quickly 100cm2. In this situation, a hair density of up 32FU per cm2 (3200FU’s / 100cm2) can be achieved. However, it is possible to make the hairline with 40 / 45FU to be transplanted per cm2 while the other areas 30FU per cm2 be transplanted. During your consultation we will looked if the current density of your hair and calculate the needed amount off grafts. 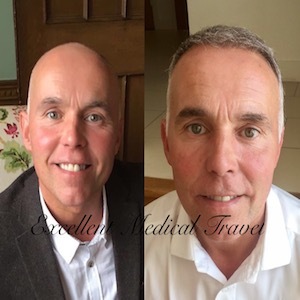 Relatively speaking, a hair transplant is not expensive, so it is a lifelong investment in yourself which you enjoy every day. A television, mobile phone or another utensil often stays with you for several years. A hair transplant is forever, but because the cost must be paid at one time it often seems expensive. You can find an indication of our prices here. Who is suitable for a hair transplant? Probably and in principle, a hair transplant is possible to everyone who has healthy hair and whose hair loss is not the result of disease and/or medication. Furthermore, if there are no medical indications we can even perform on patients with Diabetes (Type 2). Probably the most asked frequently asked questions are, will I feel any pain or discomfort? No. The treatment takes place because under local anesthesia so is therefore comparable with a visit to the dentist. Also, you will also receive afterward painkillers. So in answer to the most frequently asked questions we can tell you shouldn’t be afraid you will be in any pain.